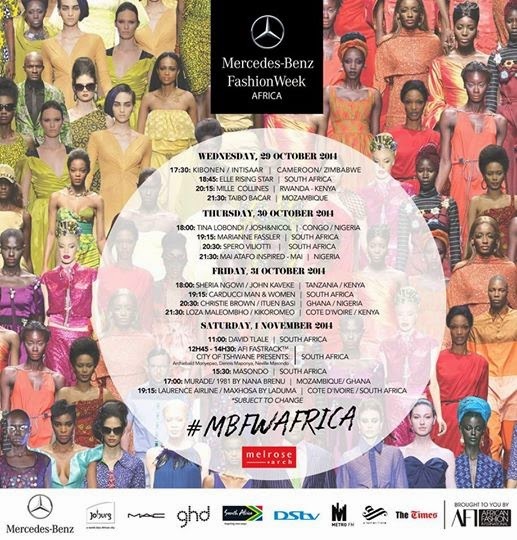 AFI brings Mercedes-Benz Fashion Week Africa (MBFWAfrica) 2014 to Johannesburg from 29 October 2014 to 1 November 2014. The city will host the continents premier annual trans-seasonal sartorial showcase at Melrose Arch. The theme for MBFWAfrica this year is ‘Our Heritage Reimagined’. This year we will see stellar collections from over 30 established and emerging designers. The prestigious African Fashion Awards will take place on 2 November 2014, which acknowledge the continents top designers. The African Trade Expo 2014 will present Africa’s latest brands and trends during MBFWAfrica. The primary focus this year for MBFWAfrica is to provide more retail access for designers and consumers globally. Each year MBFWAfrica draws countless fashion entrepreneurs, buyers, industry professionals as well as local and international media to preview the looks that will define the continents fashion in seasons to follow. The event will showcase designers from Cameroon, Tanzania, South Africa, Rwanda, Nigeria, Mozambique, Botswana, the Democratic Republic of Congo, Ivory Coast, Kenya, Ghana, Senegal and Angola.